Airborne bacteria are a major source for wound contamination during total joint arthroplasty. Crystalline ultraviolet C (C-UVC) ﬁlter units were designed to disinfect and recirculate air in the operating room (OR). This preliminary study assessed the particle reducing capacity of C-UVC units in a highly controlled OR setting. The purpose of this preliminary study is to measure the ability of a C-UVC unit to reduce airborne particulate matter related to OR foot trafﬁc in a strictly controlled OR setting, prior to measuring it’s efﬁcacy in an active, dynamic OR environment. The C-UVC unit at 4 m had signiﬁcantly lower particle levels. C-UVC units have shown to be capable of signiﬁcantly reducing TPC and VPC in a highly controlled OR setting. 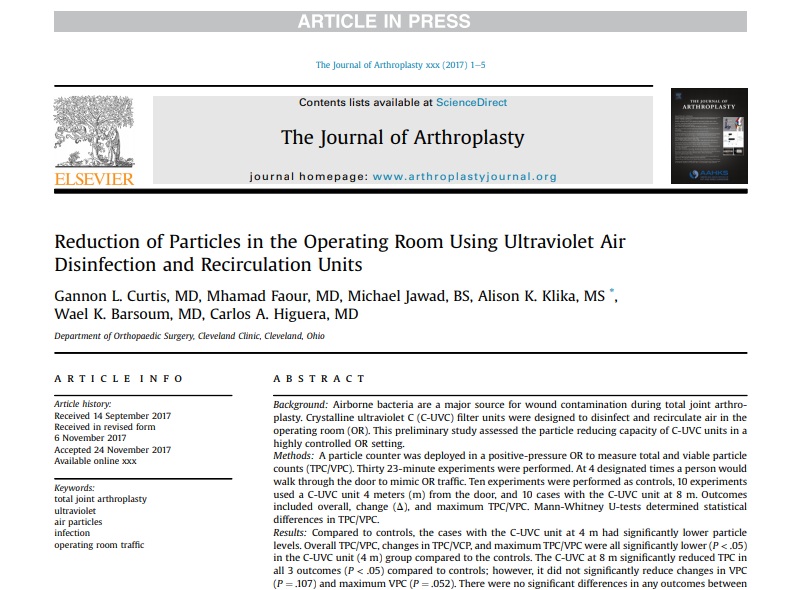 Reducing airborne particles using C UVC units may reduce infection rates following total joint arthroplasty.